To achieve the teeth you want, Zoom Teeth Whitening offers you a full range of options based on your needs and your lifestyle. Professional teeth whitening with Philips Zoom is safe, effective pain-free, teeth whitening. While it is tempting to purchase over-the-counter teeth whitening options such as strips, gels or toothpastes, we advise seeing your dentist. One of the primary reasons why we recommend this approach is because your dentist can make sure that your mouth is healthy before the whitening process. Philips Zoom professional whitening is a fast, effective and safe way to whiten your teeth. Your dental professional will either apply the treatment for you, or fit you with customised trays so you can do the treatment at home. While whitening can cause tooth sensitivity, it’s usually temporary and will typically go away once the whitening treatment is completed. 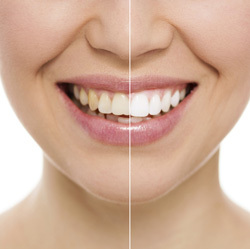 Professional teeth whitening is an excellent investment as the results can be enjoyed for several years. To help ensure your whitening results last as long as possible, you will want to avoid teeth-staining beverages and foods as well as smoking. You also can brush your teeth with a whitening toothpaste to maintain a bright smile.